Captain's Log Starship 1XE, Day 27 in the month of June in the Earth Calendar Year of 2017. Welcome to Whitefish, Montana, home to the Whitefish Mountain Ski Resort, the gateway to Glacier National Park, and 7,436 of the friendliest Montana folks and business owners that you'll ever meet. This was the site of the Western Governors' Association annual meeting, where all the governors of our Western states and territories and Canadian premiers come to debate many of the issues in the West. It is a group that works hard to be bipartisan, with their overarching goals to protect the region's natural resources and improve the lives of their communities. The modus operandi of the WGA is to enable the governors to learn from each other, leverage their influence, and take collective action across state lines and across party lines. Easier said than done, especially in this political climate, which is fast becoming the new norm. Keynote speeches were given by Secretary Zinke of the Department of the Interior, and world-acclaimed climber and activist Conrad Anker. Conrad's speech was inspirational, stressing trust, commitment, collaboration and inclusion, while the Secretary's speech was all over the place, touting the lack of trust between Western States and the federal government (I wonder why?! ), but staying firm on his and Trump's commitment to the goal of US energy dominance, and stressing that the export of fossil energy was an important part of this. He stated that he wanted to restore trust in the West, but his statements contradicted this, as they were geared primarily towards appeasing energy interests. 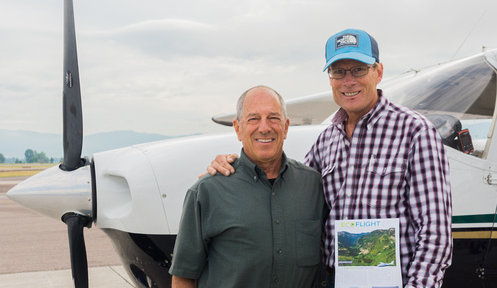 EcoFlight was on hand to punctuate the WGA meeting with overflights to highlight the incredible beauty of the landscape and the importance of working together to protect these last best places. The aerial perspective is a great platform to point out some of the shortsighted budget decisions coming out of Washington reference our public lands, whether it is defunding the Land and Water Conservation Fund by 84%, or the cutting of almost every line item for the EPA ($2.6 billion), Department of Interior ($1.4 billion) and USDA ($4.6 billion) except for energy development; or worse yet, the administration's plague of uprooting long time moderate thinking BLM and other agency employees and moving them out of leadership positions because of their professional and scientific opinions. Since 1964, LWCF monies have been used to conserve irreplaceable lands and improve outdoor recreation opportunities throughout the nation. The program works in partnership with federal, state and local efforts to protect national lands, to support state and local parks and playgrounds, and among other things to provide the tools that communities need to meet their diverse conservation and recreation needs. 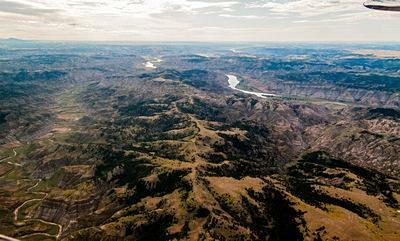 These funds have given Montana 70% of its fishing access. LWCF costs the American taxpayer almost nothing, but helps create billions of dollars every year in revenue to local communities that benefit from LWCF projects. Over the years, during WGA and other events, we have flown Montana Senators Tester and Daines, Governors Schweitzer and Bullock, and Secretary Zinke, when he was running for Congress. This year, our early morning flights were filled to the brim with politicians, media, tourism representatives, and high level staffers. We were greeted by clear cool air and the majesty of Glacier National Park (my quip: they might have to change the name in the near future if we don't address climate change), the Kootenai forest and the spectacular Jewel Basin at the north end of the Swan Valley, where recreation abounds. With Secretary Zinke and the Trump administration taking aim at our new National Monuments under the Antiquities act, we also took the time to fly the Missouri Breaks National Monument for the NY Times and Great Falls Tribune. My two cents: these monuments were created not just by the stroke of a pen but also by years of public input and debate and immense compromise. To dismantle them for ideological reasons makes no dollars and cents or sense unless you are a member of the extractive energy sector, looking for a very short term gain. Stakeholders came together from all walks of life and participated in these debates. Hence the monuments. Perhaps a little-known fact is that many of our greatest national parks were first national monuments, like Grand Canyon, Bryce, Zion, Teton and Olympic. Conrad Anker served as a guide on some of our overflights and shared the same wise knowledge as in his keynote address. He pointed out the economic benefits of having a healthy environment and sustainable ecosystems, and that outdoor industries and recreation are important economic drivers. He promoted the traits that any dedicated and successful climber knows: cooperation, preparation, honesty, and the courage to carry on, even in the face of adversity. Let's hope our Western leaders had some of those same takeaways from this year's WGA conference.